Bovidae is a taxonomic Family of cloven-hooved herbivorous animals. There are almost 140 species of Bovids spread all throughout the world. They are native to all continents but South America, Australia, and Antarctica. Some well know types include gazelles, bison, cattle, sheep, goats, buffalo, and water buffalo. Some species of Bovids tend to remain solitary, though many species are part of large groups that include social structures. 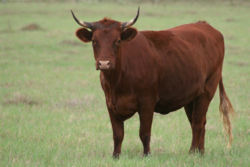 Bovids are often hunted for skins, meat, or for sport. This page was last modified on 9 October 2010, at 13:04.